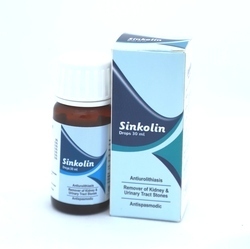 Leading Manufacturer of pathnil combo pack, herbal alkalizer and remover of kidney & urinary tract stones from Panchkula. Are kidney stones causing unbearable pain? Before any epensive and painful surgical procedures , try a 9 days Ayurvedic (Herbal) course. If stone does not pass after a reasonable period of time and causes constant pain. 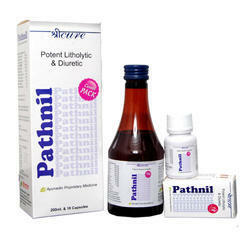 give a try to herbal remedy that is Pathnil Combi Pack,which is atherapy of 9 days only. Trials and User reports have suggested that Pathnil is effective in removing kidney stones to the size of 10 m.m ! Take 1 spoon of syrup in the morning, one in the evening preferably at 5pm. Drink a lot of water through out the day. Repeat for 9 days* for the best results. *if the Stone is bigger than 10mm, it is advisable to take more than 1 course. Jalsri Syrup is helpful in Dysuria that is pain during urination, or difficulty urinating. Dysuria is usually caused by inflammation of the urethra, frequently as a result of infection.Jalsri syrup is a herbal syrup which is a Potent Litholytic & Diuretic for Urolithisis, Bilestones, Dysuria, Burning Micturition, U.T.I. Syrup 100 ml pet bottle.